Blade mace is the reddish covering that surrounds nutmeg—which is the seed of a species of evergreen native to Indonesia. Though the two varieties of spice come from the same plant, they're not exactly the same in flavor; some people say that blade mace is sweeter and more delicate than nutmeg. Blackstone Hotel executive chef Aaron McKay, challenged by Christian Ragano of Cindy's to create a dish with blade mace, calls it "the most metal of the spices"—referring to the fact that "mace" is also the name of a medieval weapon. He describes the spice as similar to nutmeg—"it reminds you of Christmas"—with a certain sweetness and "a peppery, gingery heat to it if you have a lot." Mace is also one of the most common seasonings used in hot dogs (mace is sold either preground or in whole "blades"). 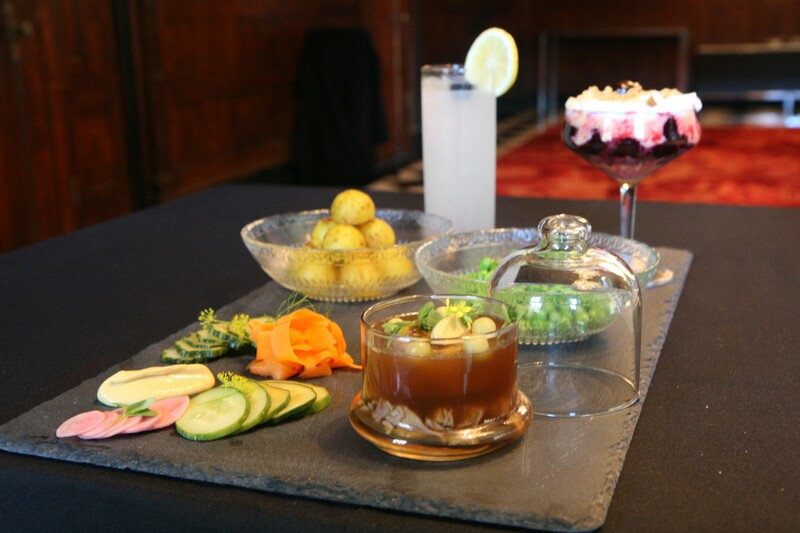 Instead of making one dish, McKay prepared a two-course meal with a cocktail pairing, incorporating blade mace six different ways. He chose a British theme, starting with a takeoff on a gin and tonic featuring blade mace syrup. The main course was potted pork with peas, potatoes, and pickles; for dessert he served a trifle. McKay found he preferred the mace in savory preparations: for the Berkshire pork, he first rubbed it with ground mace and seared it, braised it, and then used the braising liquid to make a mace-infused aspic in which he set the spinach-mushroom roulade he made with the tenderloin. He also finished the boiled potatoes with curry, shallots, and blade mace, and used mace in the pickling liquid for the cucumbers. Trifle, according to McKay, is "an English dessert: a spongy cake of some sort, pudding or lemon curd, some type of fruit. Booze is optional, but—come on. Put some booze in it." For the trifle, McKay made lemon curd, his first-ever pound cake, and cherry preserves made with blade mace and brandy. "I was really assertive with the blade mace," he says. "It's very bitter, but the sweetness and acidity of the cherries balance it out, so I could really have at it." Not only was McKay happy with how his meal turned out, he's planning to use blade mace again in the future. "I'll definitely be putting it in my pickling liquid going forward, and braised meat, it's a nice application for that as well. I'm actually really excited." McKay has challenged Tim Graham of Travelle at the Langham Hotel to create a dish with pineapple sage. "He just mentioned to me last week that he had some growing at home and didn't know what to do with it," McKay says. "Now he'll have to figure it out." Stir all ingredients except tonic in mixing glass, and add to chilled collins glass filled with ice. Top with tonic and garnish with Luxardo cherry and lemon wheel. Bring all ingredients to a boil, turn heat off, let cool for 20 minutes. Place everything in blender and quickly buzz (no more than ten seconds). Strain through fine mesh sieve, then through a coffee filter. Mix all ingredients except pitted cherries in a large pot over high heat. When it comes to a boil, flame the brandy. Continue cooking until cherries are very soft and pits are separating from fruit. Run through a food mill to remove pits, then blend. Add pitted cherries, cook until cherries are just soft, and chill overnight. Sear the shanks in a large, flat, preheated pan in batches, making sure not to overload the pan and removing seared shanks to a deep full hotel pan. Once all are seared, deglaze with sherry and pull fond from pan with a wooden spoon. When the sherry is almost all evaporated, add the onions and garlic. When the onions have gotten a bit of color, add the bay leaves, thyme, mace, and mustard. With a spatula, put everything over the shanks and cover with chicken stock until the shanks have about three inches of stock covering them. The onions should float to the top, and as you cook the shanks uncovered at 325 degrees, the onions will get a good bit of color on them. Stir every half hour until the shanks are tender but not falling off the bone. Remove the pan from the oven and pull the shanks out to cool. Pick the meat off, season, and set aside. Break the bones with the back of a cleaver and return to the hotel pan with the stock and onions. Cook for another hour, strain and reduce by a third. At this point, check the consistency of the stock by putting a small amount in a dish in the freezer for a few minutes. If it is cool to the touch and doesn't yet have the consistency of Jell-O, reduce the stock until it does. Season the stock with salt and ground blade mace to taste, strain again. Place the picked meat in small serving dishes or jars, and cover with the liquid, being careful not to splatter the liquid up the sides. Chill overnight. Allow to temper for an hour at room temperature and serve with fines herbs, mustard, and pickles. Challenged to create a dish with pineapple sage, Tim Graham of Travelle puts it in every part of a summery fish dish.